This article appeared online in Cosmos Magazine on June 11, 2018. Edward O. Wilson was born on June 10, 1929, in Birmingham, Alabama, in the US south. At age seven he went to live with a family in Florida. An entry in the Encyclopedia of Alabama recounts an incident during this period that had a lasting effect on him. An accident while fishing damaged his right eye, resulting in permanent partial blindness. His vision impairment, and the onset of partial deafness during his adolescence, led him to focus on creatures he could pick up, hold between his thumb and forefinger, and inspect closely. He would, thus, become one of the world’s foremost authorities on ants. 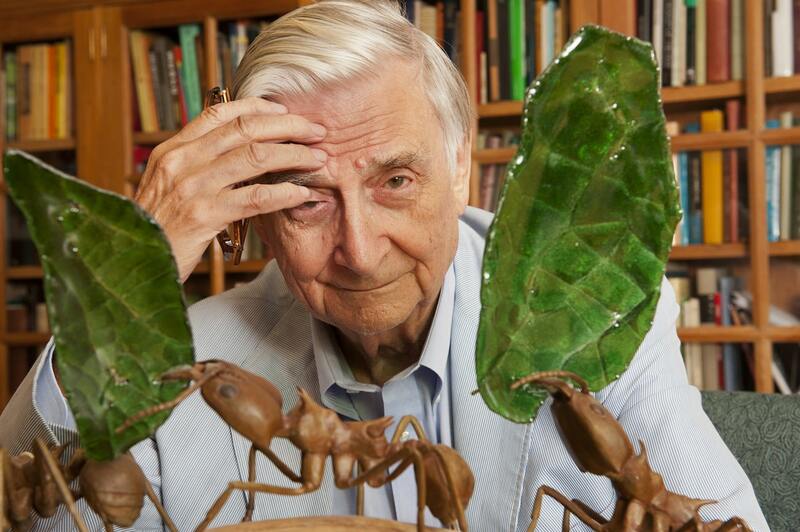 Wilson studied biology at the University of Alabama and received a doctorate in the discipline at Harvard University in 1955, the same year in which he completed his taxonomic analysis of the ant genus Lasius. In 1956, Wilson joined Harvard’s biology and zoology faculties. While recognising the importance of his ant studies, a 2001 Guardian article says Wilson is most famous for the 1975 publication of Sociobiology: The New Synthesis, “a work of deep insight that advanced evolutionary thinking and proved a Darwinian manifesto, describing social behaviour from the ants to humans”. It was also interpreted by some as a work of racism and misogyny, that it suggested some human beings are genetically superior to others, echoing Nazi doctrines on eugenics. As his viewpoints became better understood, Smithsonian.com reported in 2005, “theories he hailed as cornerstones of sociobiology have become powerful tools in the thriving young field of evolutionary psychology, the attempt to explain human emotions and thought patterns as genetically inherited adaptations. Still going strong, Wilson remains on the faculty at Harvard, and heads up his own research organisation, the E.O. Wilson Biodiversity Foundation.